Comfortable modern cottage in a sheltered garden with its own streamfront. 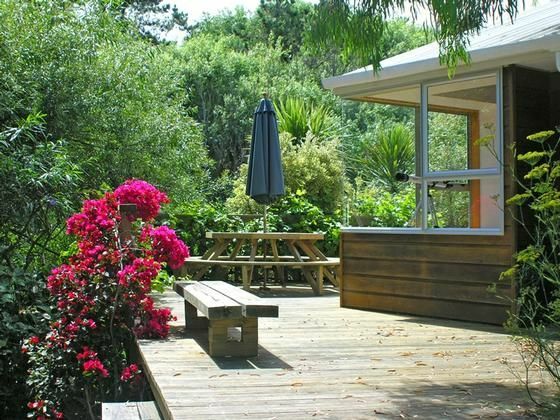 In a quiet suburban setting, 5-10 minutes walk to Otaki Beach, our bach has generous outdoor living areas looking over the Waitohu Stream and onto a reserve. We chose it as our retreat because it is warm, private and sheltered from coastal winds, while still within the sound of the sea. For winter nights there's a woodburner and firewood. It's casual but tidy, fully furnished, and equipped as we would hope to find a bach we rent. From the bach you'll be able to visit Otaki's outlet stores, explore the Tararuas, or take the rowboat for a lazy row down the stream to the beautiful, wide north end of Otaki Beach. Two night minimum stay. Most suited to a couple or small family (without toddlers, because of the stream), but additional adults can be catered for at $20 per person per night, $15 per child. Peaceful sunny and quiet with a beautiful garden. Thanks we had a great stay. The bach is clean, warm and spacious with a lovely quiet peaceful deck and garden. Accessing the property and communications were efficient and straightforward. Would definitely recommend. Amongst nature but still close to everything. Spectacular little spot hidden away with all the creature comforts. We thoroughly enjoyed our stay and felt like we were right amongst authentic New Zealand bushland unaware of any neighbours. We love this peaceful, private and sunny place. This is our third holiday at Waitohu Stream. We love that it's so green and peaceful with gorgeous outdoors, and the bouganvillea makes it extra special for us. We love the river and the beach and lying around reading. It's perfect for us. And just an hour to get home. Everything about this place is awesome. Nature the stream the boat it was very special. Communication excellent. Very clean and everything you need for a wonderful stay.